( terms & conditions apply ). ( Includes £20.00 membership fee and £5.00 top up on your bar card ). ( Please note membership is for a full year and refunds can not be given ). Golf Union fees will be charged in addition to the above. Brynhill operates a direct debit scheme, with a third party, which means you would be able to spread the cost of your fees over twelve months. 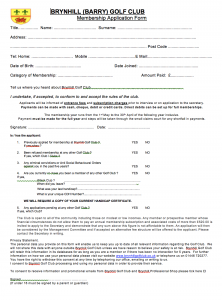 You can apply for membership to Brynhill by returning a completed application form to our postal address which can be found in the Contact Us page. Alternatively call the secretary’s office on 01446 720277 (ext 1) for more details. The Club is open to all of the community including those on modest or low incomes. Any member or prospective member whose financial circumstances do not allow them to pay an annual membership subscription and associated costs of more than £520.00 is invited to apply to the Secretary and demonstrate that any sum above this figure is not affordable to them. An application will then be considered by the Management Committee and if accepted an alternative fee structure will be offered to the applicant. Please contact the Secretary in writing.